Spacious and overflowing with rich, architectural detail, this exquisite one-story manor house plan features European charm and a modern floor plan. Bay windows and ceiling treatments grace almost every room in the house, from the porches and dining areas to the master bedroom and study. Each of the home plan's bedrooms has its own walk-in closet and the master bedroom features porch access, a bayed sitting area and well-appointed master bath. The kitchen, breakfast, great room and dining room all open to one another and simplify entertaining. Also note the enormous walk-in pantry. A rear porch and patio provide plenty of space to entertain outdoors, and when weather doesn't comply, the screen porch keeps things comfortable. 1st Floor: 2812 Sq. Ft. 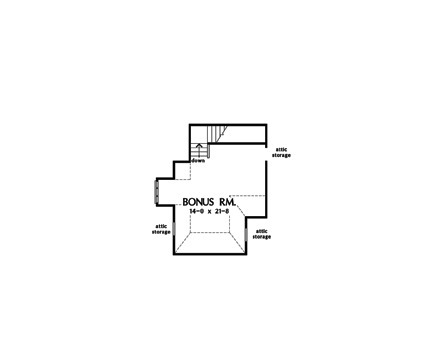 Bonus Room: 389 Sq. 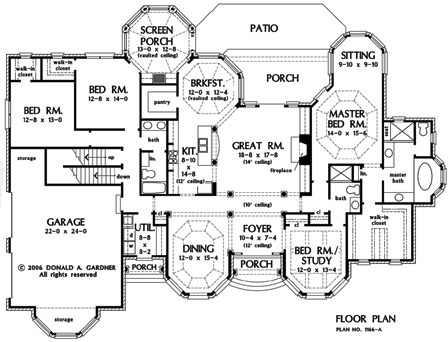 Ft.
House Dimensions: 87' 1" x 62' 3"
Great Room: 18' 8" x 17' 8"
Master Bedroom: 14' 0" x 15' 6"
Bedroom #3 : 12' 8" x 14' 0" x 9' 0"
Bedroom #4 : 12' 8" x 13' 0" x 9' 0"
Bedroom / Study (Other): 12' 0" x 13' 4" x 14' 0"
Bonus Room : 14' 0" x 18' 0" x 8' 0"
Breakfast Room (Vaulted): 12' 0" x 12' 4" x 16' 6"
Deck / Patio : 28' 5" x 9' 0" x 0' 0"
Dining Room (Tray): 12' 0" x 15' 4" x 14' 0"
Foyer : 10' 4" x 7' 4" x 12' 0"
Garage Storage : 6' 10" x 3' 8" x 0' 0"
Garage Storage Bay : 12' 0" x 5' 4" x 0' 0"
Great Room : 18' 8" x 17' 8" x 14' 0"
Kitchen : 8' 10" x 14' 8" x 12' 0"
Master Bedroom (Tray): 14' 0" x 15' 6" x 11' 0"
Porch - Rear : 17' 3" x 10' 8" x 12' 0"
Porch - Front : 9' 9" x 5' 0" x 12' 0"
Porch - Screen (Vaulted): 13' 0" x 12' 8" x 16' 11"
Utility Room : 8' 8" x 8' 2" x 9' 0"